Last weekend I did something I’ve never done before: I cooked an entire chicken. I really don’t like to know my food in ways that remind me it was once alive, and bones have a tendency to do that. Plus, bones in food are just kind of gross and annoying. Most of my cooking of animals revolves around boneless and skinless. But I kind of had chicken & noodles on the brain. The weather got cold and something warm & smushy (which is how I tend to define comfort food) was sounding good, and I’ve never made it before, so I thought why not? A Google search for “easy chicken & noodle recipe” yielded several easy-sounding chicken & noodle recipes. (The internet is amazing, no?) And they all called for cooking a whole chicken. Okey dokey, I can do this. 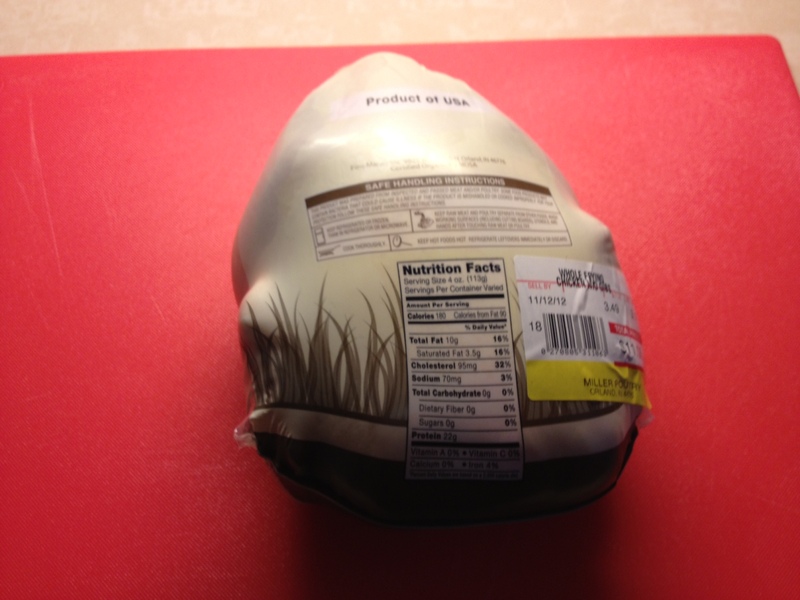 Plus, someday soon I would like to cook a turkey, and cooking a chicken is probably a good gateway poultry opportunity. I addressed the chicken situation immediately so I could get the traumatic part out of the way. Okay, I am a little scared of you. Fortunately all I had to do was cut it up a little bit and throw it into the pot. Am I the only one who always starts with too small a pot? Anytime I make soup or chili or anything in a big pot, I always underestimate the size of the pot necessary. Which meant I had to touch the chicken again. Ew. But once the chicken and vegetables and broth are in the pot, all you do is wait – it really was ridiculously easy. Ooh. Except for the noodles. All the recipes I found also called for making your own noodles, which wasn’t on my radar at all. But all these yahoos on the internet were doing it, so how hard could it be, right? I figured I’d give it a try. That was my only real mistake. I need to remember that things involving rolling pins are not in my skill set. (Seriously. I cannot make cutout cookies. It’s the weirdest thing.) Although someday I will make a delicious pie crust. I truly believe this. Will report back on that one. Anyway, the noodles….eh. I wasn’t very precise in my sizing of the noodles, so some of them got….unwieldy, shall we say. And doughy. I did eat a meal of the chicken & homemade noodles and they were fine, but not delicious. I think I could tweak what I did and figure out how to make them better, but the better solution was to fish out my ridiculous noodles and throw in the bag of egg noodles already in my pantry. When I had that the next day in leftover form, the whole thing was yumtastic success. And being just one person, I had enough for multiple meals, plus froze two large batches for future enjoyment. I took a little bit from a couple of different recipes on allrecipes.com, and made a couple modifications of my own, so here’s a rough estimate of what transpired – not to suggest this is a breakthrough into some innovative culinary world of chicken & noodles. 🙂 I just figured I’d share, as long as we’re both here and maybe you now have a similar craving – save you some browsing time. 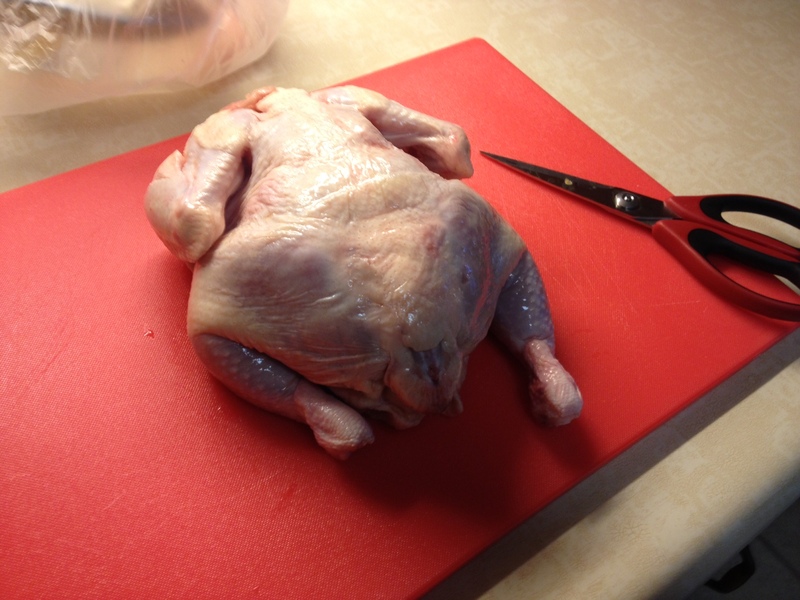 Cut a whole (2-3 pound) chicken into pieces. Which I barely did – I think mine was two large pieces. That whole not wanting to handle it thing. Put the chicken pieces into a large (um, yeah) pot with four or five stalks of celery (diced), 1 onion (halved), and a handful or two of baby carrots, or chunks of carrots, or whatever shape you like your carrots to be. I really like cooked carrots, so I think next time I would use more. A lot more. Like a pound of baby carrots, if I were cooking a whole chicken again. Pour three 32-ounce containers of chicken broth into the pot, and add salt and ground black pepper to taste. Bring to a boil over high heat. Cover, reduce heat, and simmer until chicken is tender and falls from bone, approximately 45 minutes to an hour. While chicken is cooking, realize that making your own noodles is completely unnecessary and go sit down. When the chicken is done, turn off the heat and remove the meat so it can cool for a few minutes. While it’s cooling, strain the chicken stock. Reserve the carrots and celery to go back into the pot. Remove the skin from the chicken and pull the meat from the bones. 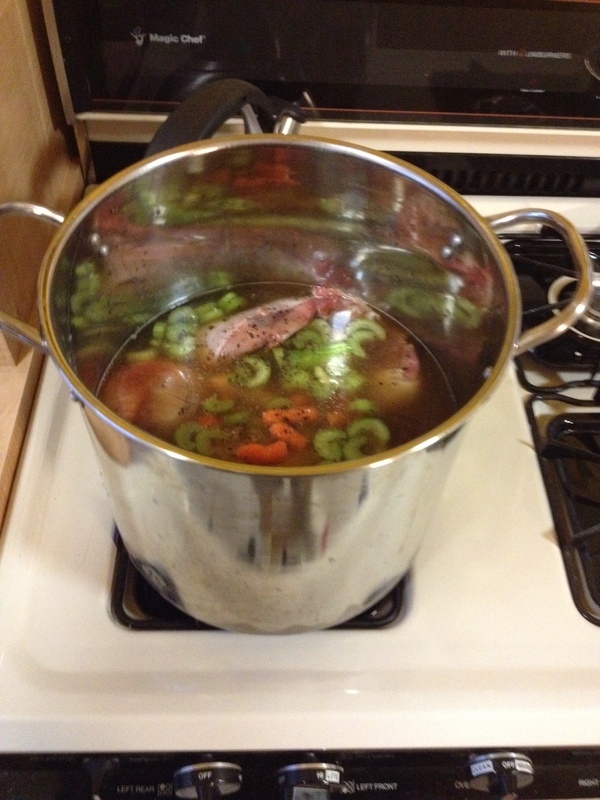 Add the meat, carrots and celery back to the broth, and bring it to a boil. Add the noodles of your choice and cook till they’re tender and ready for eatin’. Fewer noodles = brothier and more like soup. More noodles = thicker and more like something to eat with a fork. THis is great! You just gave me the motivation to cook a whole chicken! I just bought a roaster so I’m thinking of starting there..then I shall make stock, soups…We shall see how that goes haha..easier said then done. Like you, I don’t do bones..or skin. However, it sure will save me a lot of money! I did, and I survived. And it was totally worth it. You are a domestic goddess. Good advice on the noodles. I’m the same way about food & bones, so I understand the effort to overcome the grossness of handling the raw chicken! Way to go, and glad it turned out well.